A forager’s first harvest of the season. Yes, this is what a forager’s harvest looks like. Pretty awesome, isn’t it? 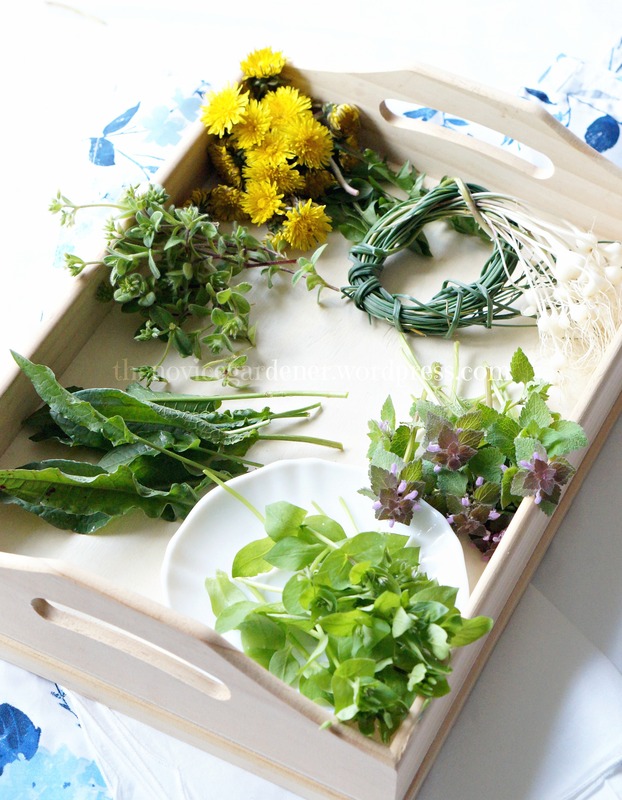 Clockwise, starting from the top: Dandelion blossoms & greens, field garlic, purple deadnettles, chickweed, curly dock leaves, mouse-eared chickweed. 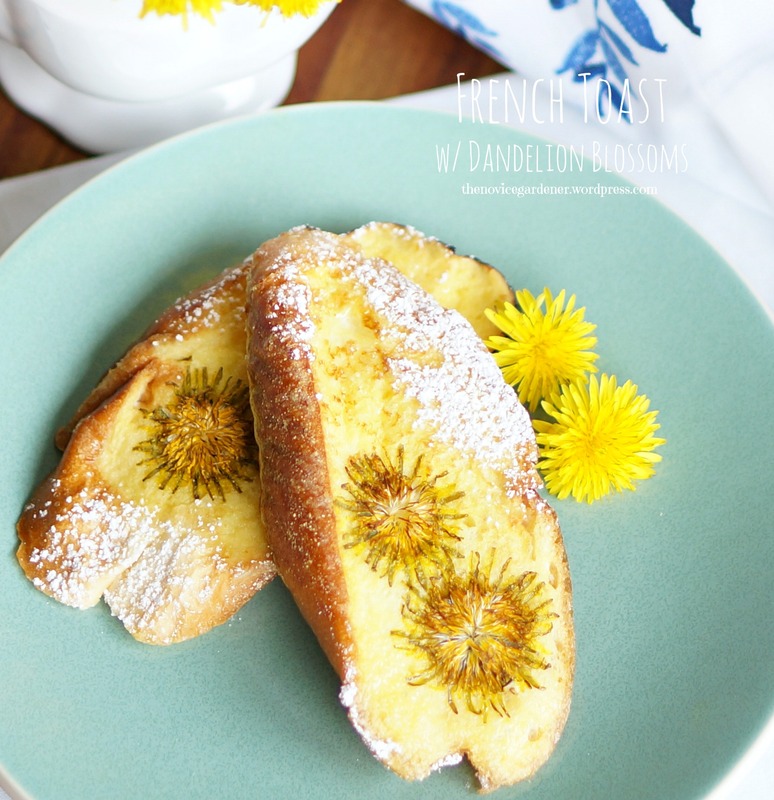 The dandelion blossoms were added to French toast. 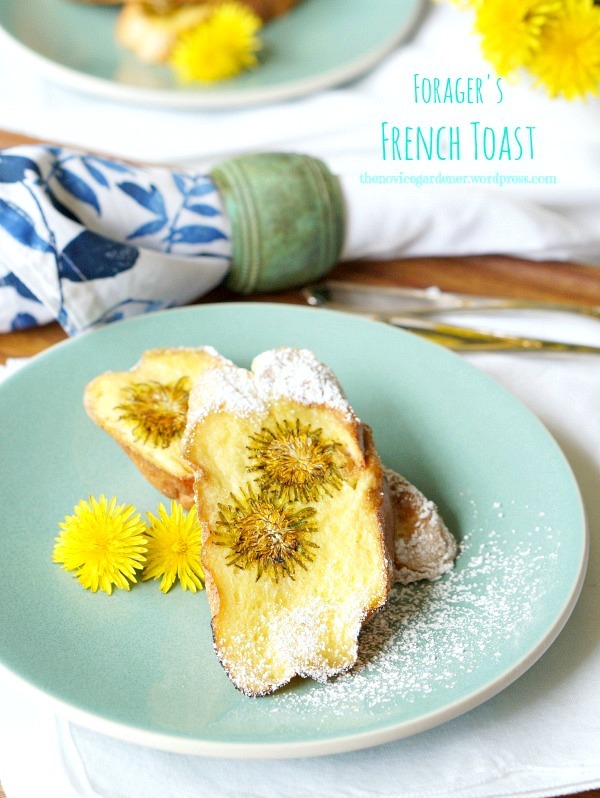 Yes, this is what a forager’s French toast looks like. Pretty, isn’t it? 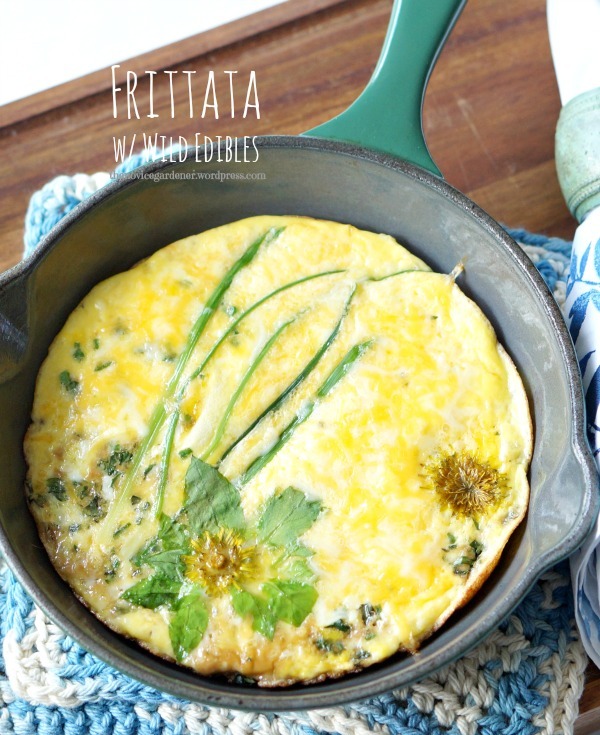 The rest of the weeds went into a frittata. 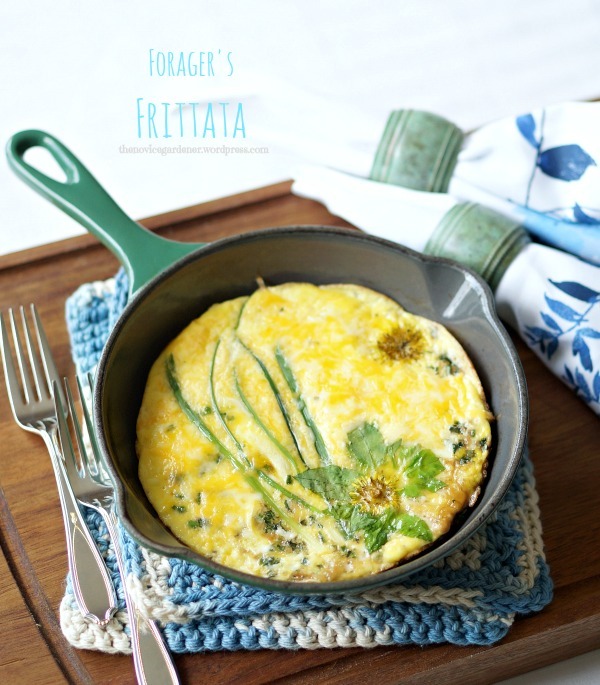 Yes, this is what a forager’s frittata looks like. Doesn’t look much different from any other frittata, does it? A forager eats well. Ask my fellow forager, Hilda@Along The Grapevine, if you don’t believe me. As for the French toast, I’ll just describe what I did. I started with my regular French toast recipe, which is really just 2 beaten eggs mixed with 1/2 cup of milk and 1 tsp sugar. A pinch of cinnamon or a few drops of vanilla may be added, but that’s totally optional. This is enough liquid for about 6 slices of bread. I dipped my bread in the egg mixture, coating both sides. In a frying pan, either sprayed with cooking spray or coated with a small amount of melted butter, cook bread on both sides on medium-high heat until golden brown. Before flipping the bread to cook the second side, however, I poked a small hole on the bread with a chopstick and placed a dandelion blossom in it, face up. Then, I flipped it gently and cook the other side (the one with the blossom attached). That’s it! Unlike the greens, dandelion blossoms are not bitter, but are in fact slightly sweet. Try to get rid as much of the green sepals as possible if you dislike the bitterness. Hey I DID grow up! That’s the problem! I ate weeds all the time as a kid LOL 😉 I love blogs like yours that unintentionally inspire… they’re not so creepy as the ones that are trying. That frittata looks like a Monet painting!!! Wow Angie!! Well, now you have at least a couple. I have a recipe for dandelion fritters, too. And I’m thinking of making dandelion wine or syrup next. Lots of things you can make out of dandelions. Yes, a Monet painting, or a Dufy. Edible artworks. Love it. Aww, thats’s so sweet of you to say, Trish! A fan of Dufy here, btw. Thanks. Want me to send you dandelion seeds? Lol… I think your neighbors might evict you if you plant dandelions. Your artful presentation, from the way you feature the actual products from your gardens to the food, incorporating dandelions and herbs is such a wonderful ‘gift’ or talent that you share with us! I cannot believe how you are able to produce these lovely posts, time after time. Everyone is in awe of them! That frittata looks fantastic but it’s your French toast that caught my eye. We are big fans of dandelion greens but never have we done anything with the blossoms. I’d no idea that they were tasty. I really do have to give them a try. Thanks for the heads-up. You know what, I actually prefer the flowers than the greens, which I’m still trying to get used to. With a lot of bacon, they taste pretty good, but only with a lot of bacon :-). Just a couple of days ago, I tried the boiled roots for the first time. Stringy but not as bitter as the leaves! Lots to learn from the humble weeds, don’t you think?